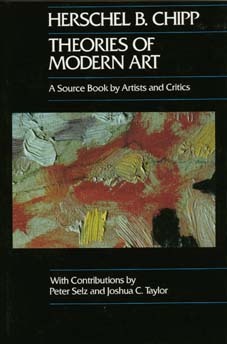 Herschel B. Chipp's Theories of Modern Art: A Source Book By Artists and Critics is a collection of texts from letters, manifestos, notes and interviews. Sources include, as the title says, artists and critics—some expected, like van Gogh, Gauguin, Apollinaire, Mondrian, Greenberg, just to name a few—and some less so: Trotsky and Hitler, in the section on Art and Politics. The book is a wonderful resource and insight into the way artists think and work. Herschel B. Chipp is Professor of Art History at the University of California in Berkeley and the author of Theories of Modern Art.